1914: Launched by The John Duthie Torry Shipbuilding Co, Aberdeen (Yd.No.405) for The National Steam Fishing Co (Aberdeen) Ltd, Aberdeen as LEUKOS. 27.8.1914: Registered at Aberdeen (A102). James Scott Jnr appointed manager. 6.1915: Requisitioned for war service as a boom defence trawler (Ad.No.N.I.). Based Scapa, Orkney. 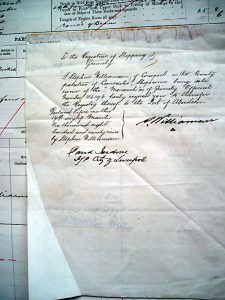 27.1.1920: Sold to Arthur Reginald Tucker & James Cornelius Tippet, Cardiff. James Cornelius Tippet appointed manager. 2.4.1920: Sold to Tucker, Tippet & Co Ltd, Cardiff. James Cornelius Tippet appointed manager. 1922: Fishing from Milford. Harry E. East managing agent. 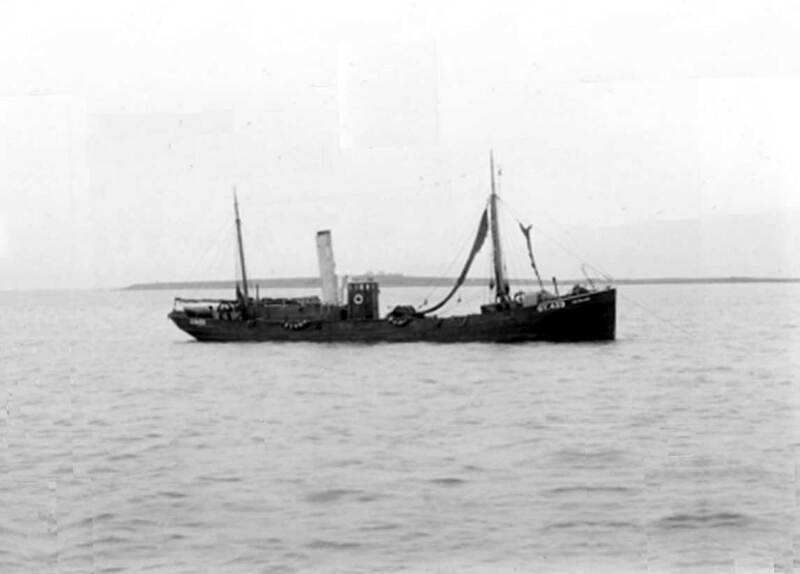 27.2.1927: Sailed Milford for the fishing grounds (Sk. Edward Major). Owing to weather outside came to anchor off Popton Point. 28.2.1927: At about 10.00am. observed trawler THOMAS BARTLETT (LO373) coming in from sea and anchored close by, the wind was south west to west blowing a strong gale. The bosun, Charles Richard Johnson was on anchor watch, and reported to the skipper that the THOMAS BARTLETT was dragging and when some 20 to 30 yards away it appeared she would drive across the bows. The whistle was sounded and the THOMAS BARTLETT eased her cable and started to come astern but did not clear, hitting the stem with the port side, the head coming round to starboard and the THOMAS BARTLETT dropped down along side on the starboard side. No damage to the stem was apparent. 28.2.1927: Sailed for the fishing grounds but found water ingress in way of the stem, temporary repair carried out by Ch Eng. and continued on voyage. 1.6.1927: Last landing at Milford. 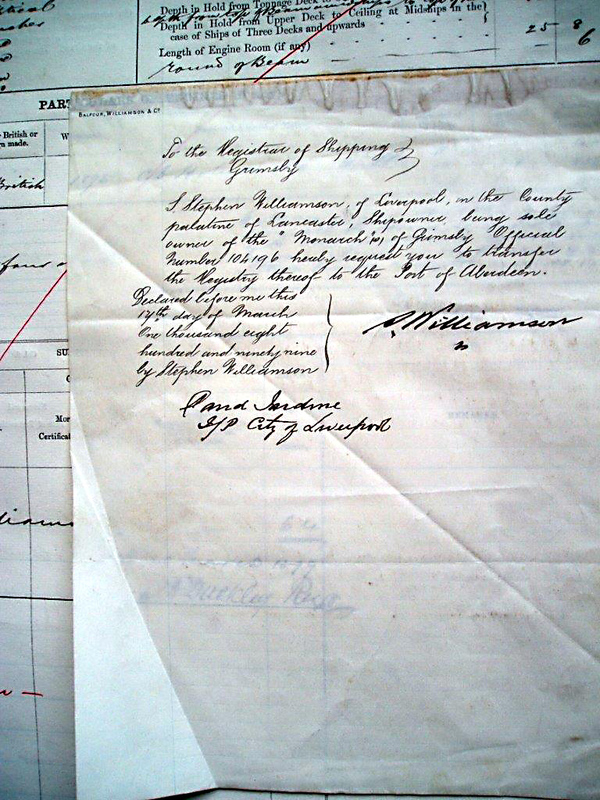 18.6.1927: Sold to Dublin Trawling, Ice and Cold Storage Co Ltd, Dublin. 6.1927: Registered at Dublin (D86). Patrick Fannon appointed manager. Occasional landings at Fleetwood. Mid 2.1940: Last landing at Fleetwood. 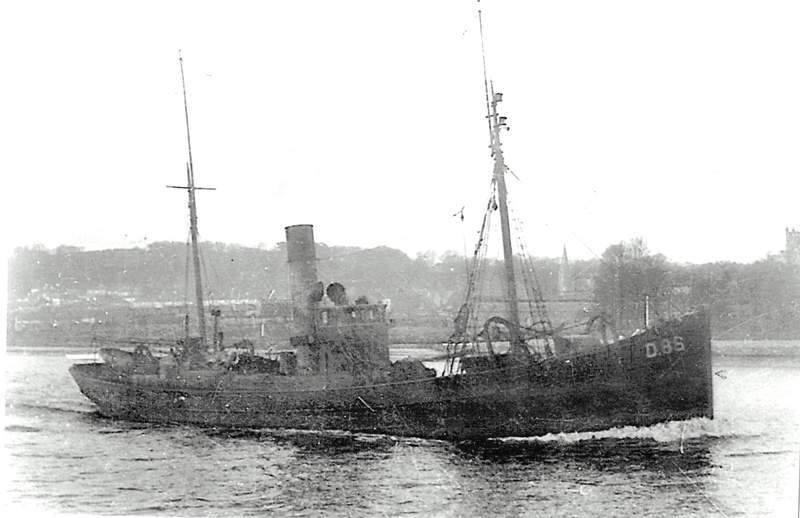 29.2.1940: Sailed Dublin for the fishing grounds via Troon to coal (Sk. James Potter Thomasson); eleven hands all told. 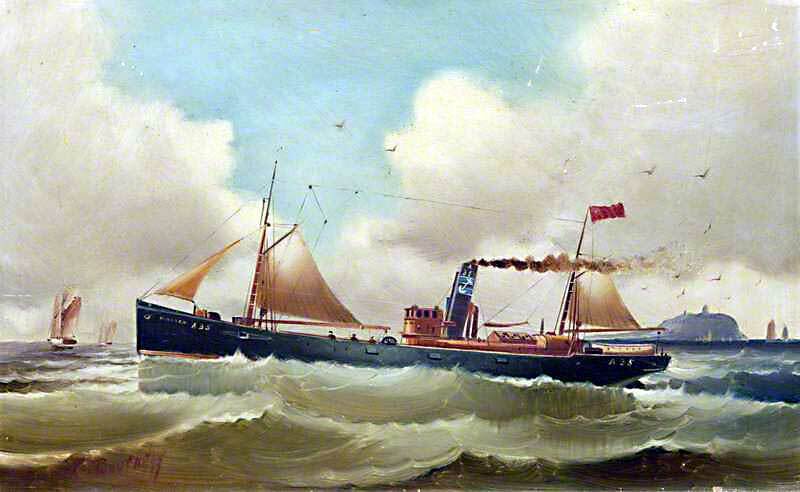 The ship had the Irish tricolour painted on her hull clearly indicating a vessel from a neutral country; fitted with wireless. 1.3.1940: Sailed Troon for the ‘the bank’ off Tory Island. 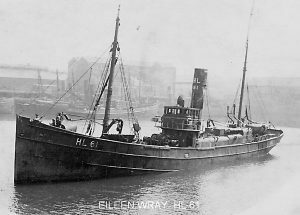 9.3.1940: In forenoon spoke to two other trawlers of the same company in Donegal Bay, confirmed a good catch and ETA Dublin 12.3.1940. 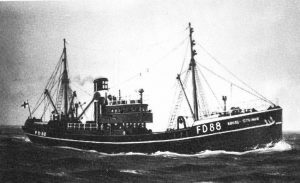 9.3.1940: A group of Fleetwood trawlers fishing 12 miles NW of Tory Island, Co. Donegal, ALVIS (H52); FLYING ADMIRAL (H66); JOHN MORRICE (A786); PELAGOS (GN55) and SEDOCK (GY123) and reported with the Irish trawler LEUKOS (D86) also in the vicinity. At 2003 (Wilhelshaven time) a U-boat (U.38) surfaced having observed through periscope and listening device the group of trawlers. On the surface noticed that all had their lights on and were apparently forming a guarding line on a N-S course. In his log the CO. Kptlt. Heinrich Liebe wrote “I decided to administer a warning to one of them with the gun.” At 2113, and within about 200 metres of the target, fired a single round at a ship, hitting her in the engine room; the U-boat withdrew staying on the surface about one hour until ship foundered. No attempt was made by the U-boat to identify the vessel or search for survivors. None of the five trawlers in the vicinity closed to investigate, if in fact they were aware of the incident. Although no conclusive evidence confirms, the ship probably was the LEUKOS; all eleven crew lost*. 16.3.1940: Owners expressed fears for the safety of the vessel. 21.3.1940: Lifeboat containing a lifebuoy bearing the name ‘S.T. LEUKOS’ washed up at Scarinish, Tiree, Inner Hebrides. This entry was posted in Non Fleetwood Vessels, Seasonal Visitors, Steam Trawlers, Steamers (Picture), War Losses and tagged No Fleetwood owners on February 8, 2016 by Fred Smith. 8.1899: Completed as a well vessel. 25.8.1899: Registered at Grimsby (GY530). 25.8.1899: Robert W. Windeatt appointed manager. 6.1908: Sold to Stoomvisscherij Mij Friesland, IJmuiden through Maatschappij tot Beheer van Steamtrawlers en Andere Vaartuigen. 23.6.1908: Registered at IJmuiden as FRIESLAND (IJM16). A. G. Meeuwenoord Jnr & A. de Vries designated managers. 6.1908: Sold to Maats “Friesland”, IJmuiden. 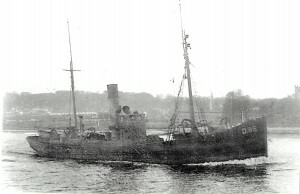 6.1908: Registered at IJmuiden as FRIESLAND (IJM109). 5.1909: Sold to Arthur Smith, Grimsby. 5.5.1909: Registered at Grimsby as FRIESLAND (GY459). 5.5.1909: Alick Black appointed manager. Converted to a trawler. Well closed by rivets. Fishing from Fleetwood. 20.2.1911: Arrived Fleetwood with 600 boxes of hake caught off the Moroccan coast, £600 – £700 gross. 1914: Sold to Henry Burns and W. Burns, Grimsby for the sum of £4,000. 12.1914: Requisitioned for war service and converted to a boom defence vessel (1-12pdr). 1917: Sold to The Zaree Steam Fishing Co Ltd, Grimsby for the sum of £9,000. Henry Burns appointed manager. 9.1919: Returned to owners without being reconditioned, the company being allowed £3,630 for the necessary reconditioning work. 10.10.1919: Sailed Grimsby on first trip after reconditioning. 6.1920: Dry-docked for inspection, cleaning and painting. 12.1920: Laid up in Alexandra Dock which was also the timber pound. 6.5.1921: Manager ordered vessel prepared for sea, intending to make one trip to avoid dock dues. Engineering Superintendent, Mr Waddingham, advised dry-docking to inspect bottom but this was not pursued by the manager. 11.5.1921: Insured with Lloyds for the sum of £10,000 for one month from this date. Book value £6,000. 12.5.1921: Sailed Grimsby at 9.30am. for North Sea grounds (Sk. Henry Ormonde); ten hands all told. Weather fine, sea calm and slight SE breeze. Shortly after noon, deckhand Anderson went into the engine room to see his friend the 2nd Eng and noticed water in the bilge and the engine connecting rod bottom ends were splashing in water as they revolved. The 2nd responded saying, “Yes, the ship is leaking”. The water ingress was not reported to the skipper. At dinner shortly after 1.00pm. the third hand asked the 2nd how the ship was going and he replied, she was “ leaking like a basket”. The third hand asked if it was a case of going back but the 2nd replied that he did not know. This conversation was confirmed by others present. The skipper was not informed. At 2.00pm. the trimmer, John Love, who had listened to the conversation after dinner went into the engine room to get a lamp and observed that the cranks were splashing around in the crank pit. At 3.45pm. the Ch Eng noticed a knocking in the high pressure crank bearing and asked the second hand who was on watch to stop the ship so he could inspect and tighten up. The nuts were tightened and the engine restarted but after about twenty minutes the 2nd called for the Ch Eng. and on arriving in the engine room saw that water was rushing in. The ejector and the donkey pump was started but the water was quickly over the plates and the shipside valve for the ejector was under water and could not be opened up. In the stokehold the water had risen so much that the boiler could not be fired. The skipper was called and on seeing the amount of water, knee deep over the engine room plates, ran on deck and by steam whistle and flag signalled the steam trawler NAIRANA (H528) which had just overtaken them, to come to their assistance. The NAIRANA some three miles away immediately turned and came within hailing distance. The crew had set to work with the hand pump and buckets but were quite unable to deal with the ingress of water. The water rose and put out the fires and shortly after the engine stopped. The NAIRANA came alongside, connected and for about three-quarters of an hour towed towards the coast but the vessel started to settle and the skipper thought it advisable to to let go the tow line and he and the crew got into the boat which they had previously tuned out. At about 6.15pm. they all boarded the NAIRANA. At about this time the Hull trawler TANJORE (H759), homeward from the fishing grounds came on the scene. The three skippers and the mate and Ch Eng of the FRIESLAND went back onboard but it was evident that nothing could be done to save the ship. At about 7.30pm. the FRIESLAND foundered sinking stern first in position about 25 miles NE1/2E from Spurn lightship. 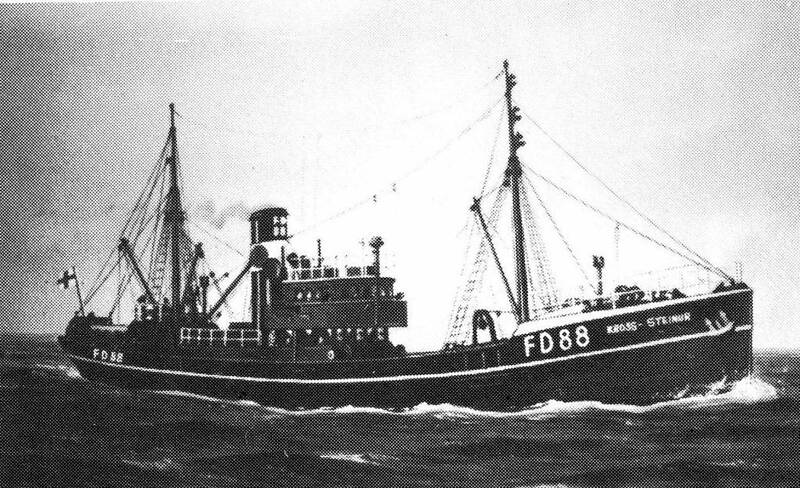 The crew transferred to the TANJORE and proceeded to Hull, the FRIESLAND crew later transferring to the Grimsby trawler ELITE (GY100) which landed them safely at Grimsby with most of their belongings. 12.5.1921: Grimsby registry closed. “Vessel foundered”. 5.9.1921: Following the formal investigation held at Grimsby, the Court found that the FRIESLAND was lost by foundering in consequence of the inrush of water, the cause of which the Court is compelled to leave undetermined. The Court also considers Mr. Henry Burns to blame for not accepting Mr. Waddingham’s suggestion that she should be dry-docked and thoroughly examined before she went to sea, and ordered him to pay £200 towards the costs of the Inquiry. The Chief and 2nd Engineers deserve severe censure for not having informed the skipper that the vessel was making water at a much earlier time than they did. Their default in this matter greatly reduced the chance of the vessel being turned round and regaining the land before foundering. 28/01/2016: Picture added and information updated. This entry was posted in No entries in this category, Steamers (Picture) on January 25, 2016 by Fred Smith.